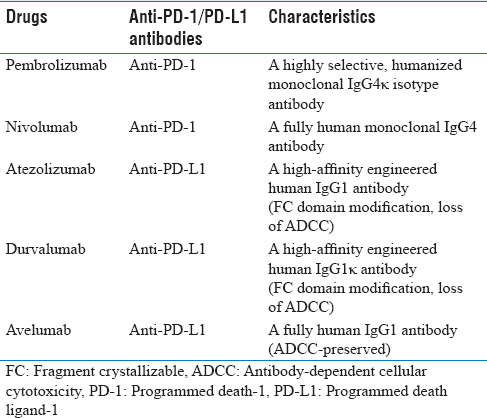 There have been five human or humanized anti-PD-1/PD-L1 monoclonal antibodies approved by the US Food and Drug Administration (FDA) in different stages [Table 1]. 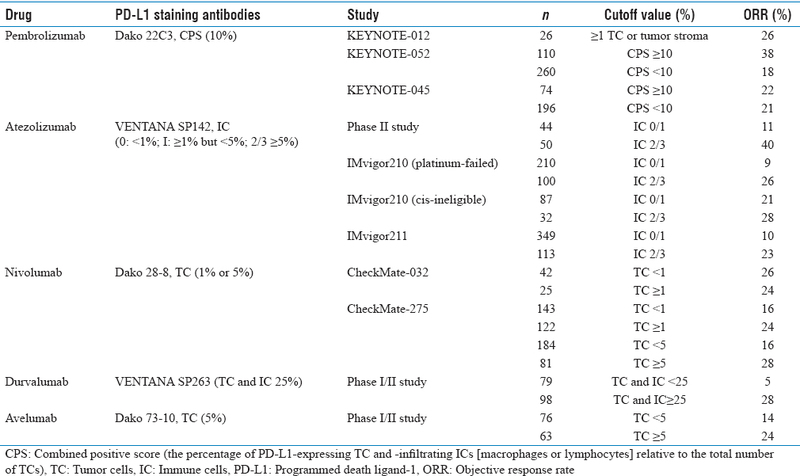 Two IgG4 antibodies, pembrolizumab and nivolumab, are anti-PD-1 antibodies., Three IgG1 antibodies, atezolizumab, durvalumab, and avelumab, are anti-PD-L1 antibodies.,, Modifying fragment crystallizable domain of antibodies to avoid antibody-dependent cellular cytotoxicity (ADCC) was performed on atezolizumab and durvalumab. Only avelumab retains the ability of ADCC.,, Taiwan FDA also approved two anti-PD-1 antibodies (pembrolizumab and nivolumab) and one anti-PD-L1 antibodies (atezolizumab) in advanced UC currently. Patient with advanced UC, especially upper urinary tract UC, are easily become cisplatin-ineligible due to nephrectomy for localized disease and (neo) adjuvant platinum-based chemotherapy. The prognosis of cisplatin-ineligible patients with advanced UC is generally inferior to cisplatin-eligible patients. The median PFS and OS for cisplatin-ineligible patients with advanced UC were about 4–6 and 8–9 months, respectively. The ORR to GC or M-CAVI is about 30%–40%. KEYNOTE-052, a single-arm phase II study, demonstrated the efficacy of pembrolizumab (200 mg, intravenous every 3 weeks) in cisplatin-ineligible patients with advanced UC. The primary endpoint was ORR in patients with PD-L1-expressing tumors. A total of 374 patients were enrolled and the ORR was 24%. Median PFS and OS were 2.0 (95% confidence interval [CI] 2.0–3.0) and 11.5 months (95% CI 10.0–13.3), respectively. Atezolizumab also showed anticancer activity for cisplatin-ineligible patients with advanced UC from IMvigor210, a single-arm phase II study. The primary endpoint was independently confirmed ORR per Response Evaluation Criteria In Solid Tumors version 1.1 (RECIST 1.1). A total of 123 patients were enrolled and the ORR was 23%. Median PFS and OS were 2.7 (95% CI 2.1–4.2) and 15.9 months (95% CI 10.4 to not reached), respectively. In summary, both pembrolizumab and atezolizumab have demonstrated their efficacy in cisplatin-ineligible patients with advanced UC. [Table 2] summarizes these two clinical trials. In summary, the two anti-PD-1 monoclonal antibodies (pembrolizumab and nivolumab) and three anti-PD-L1 monoclonal antibodies (atezolizumab, durvalumab, and avelumab) have demonstrated their efficacies in advanced UC patients failed to platinum-based chemotherapy. 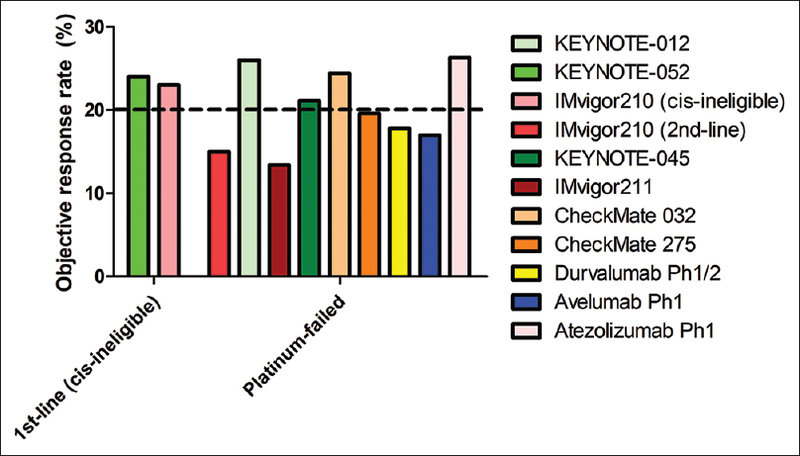 [Table 3] summarizes these clinical trials focusing on advanced UC patients failed to platinum-based chemotherapy. Because the five monoclonal antibodies block PD-1/PD-L1 axis, the expression of PD-L1 becomes unequivocally biomarker under active investigation. However, the data are still controversial due to different assays or antibodies, cutoff values, and evaluations. For example, in KEYNOTE-052 study, high PD-L1 expression (≥10%) defined by CPS (the percentage of PD-L1-expressing tumor and -infiltrating ICs [macrophages or lymphocytes] relative to the total number of tumor cells [TCs]) was associated with higher ORR (38%) and low PD-L1 expression (<10%) defined by CPS was associated with lower ORR (18%). However, in KEYNOTE-045 study, high and low PD-L1 expressions have similar ORR (22% and 21%, respectively). In summary, higher PD-L1 expression may be associated with higher ORR, but lower PD-L1 expression does not completely offset the chance of response. 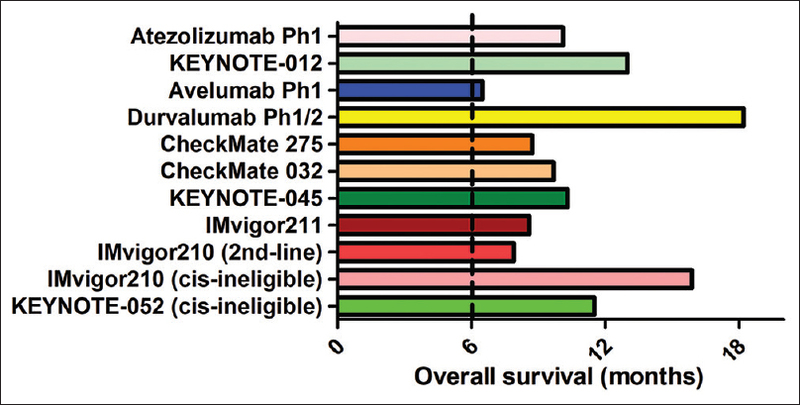 [Table 4] summarizes the PD-L1 expression and the ORR in published studies. PD-1/PD-L1 blockade has changed the paradigm of treatment for patients with advanced UC and our daily practice. The ORR is about 20% [Figure 1], and several ways to enhance the clinical efficacy of PD-1/PD-L1 blockade alone such as combination with either conventional therapeutic modality, targeted therapy, or other kinds of immunotherapy are undergoing. Besides, the median OS is summarized in [Figure 2]. PD-L1 expression alone is not satisfied biomarkers and studies about better predictive biomarkers are under active investigations. ICI-related AEs were generally lower than chemotherapy. However, irAEs should be closely monitored and managed. Taiwan Cancer Registry. Avaialble from: http://tcr.cph.ntu.edu.tw/main.php?Page=A5. Lamm DL, Blumenstein BA, Crawford ED, Montie JE, Scardino P, Grossman HB, et al. A randomized trial of intravesical doxorubicin and immunotherapy with bacille Calmette-Guérin for transitional-cell carcinoma of the bladder. N Engl J Med 1991;325:1205-9. Pardoll DM. The blockade of immune checkpoints in cancer immunotherapy. Nat Rev Cancer 2012;12:252-64. Motzer RJ, Escudier B, McDermott DF, George S, Hammers HJ, Srinivas S, et al. Nivolumab versus everolimus in advanced renal-cell carcinoma. N Engl J Med 2015;373:1803-13. Plimack ER, Bellmunt J, Gupta S, Berger R, Chow LQ, Juco J, et al. Safety and activity of pembrolizumab in patients with locally advanced or metastatic urothelial cancer (KEYNOTE-012): A non-randomised, open-label, phase 1b study. Lancet Oncol 2017;18:212-20. Petrylak DP, Powles T, Bellmunt J, Braiteh F, Loriot Y, Morales-Barrera R, et al. Atezolizumab (MPDL3280A) monotherapy for patients with metastatic urothelial cancer: Long-term outcomes from a phase 1 study. JAMA Oncol 2018;4:537-44. Patel MR, Ellerton J, Infante JR, Agrawal M, Gordon M, Aljumaily R, et al. Avelumab in metastatic urothelial carcinoma after platinum failure (JAVELIN solid tumor): Pooled results from two expansion cohorts of an open-label, phase 1 trial. Lancet Oncol 2018;19:51-64. Haanen JBAG, Carbonnel F, Robert C, Kerr KM, Peters S, Larkin J, et al. Management of toxicities from immunotherapy: ESMO clinical practice guidelines for diagnosis, treatment and follow-up. Ann Oncol 2017;28 (suppl_4):iv119-iv142. Haanen JB, Carbonnel F, Robert C, Kerr KM, Peters S, Larkin J, et al. Management of toxicities from immunotherapy: ESMO clinical practice guidelines for diagnosis, treatment and follow-up. Ann Oncol 2017;28:iv119-iv142.